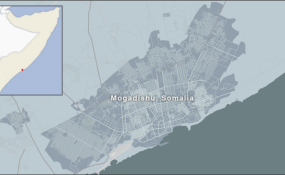 Two suicide car bombs exploded in Mogadishu on Thursday evening, killing at least 15 people, a Somali official told VOA. The first explosion occurred just after the 8 p.m. local time when a vehicle loaded with explosives were detonated on one of the capital’s busiest streets, Maka Al-Mukarama Road. Eyewitnesses said dozens of people were sitting outside hotels and restaurants in the area when the bomb exploded. Journalist Abdishakur Mohamed Mohamoud was sitting outside a coffee shop when it occurred. Mohamoud said saw 13 dead bodies when he returned to the site of the explosion to help some of the wounded. He said among the dead was a well-known imam who used to lead prayers on Maka Al-Mukarama Road for people who could not reach mosques. An hour after the explosion, a second one occurred outside another hotel near the busy K4 junction in Mogadishu. There was no confirmation of casualties from the second explosion. Security officials also reported the sound of gunshots and detonated grenades in buildings near the site of the first explosion. A security official, who asked not to be named, told VOA Somali that several al-Shabab fighters are holed up in the building. Al-Shabab claimed responsibility for the attack. The group also claimed that they carried out a complex attack on Hotel Maka Al-Mukarama.